As I talk to more women it seems that we all begin to follow this path of check marks and lists. A list for yourself, a list for your marriage, a list for your children, a list for your life. It doesn’t matter if a woman is a mother, married, employed, young or old even our hobbies have rules and expectations set by not only our culture but ourselves. Consistently striving to reach a level of perfection that once achieved will only morph into another level to reach. A snowball effect that ultimately means perfection will never be achieved, leaving us women to run like frantic caffeinated hamsters on hot pink wheels in a plastic cage of life that we’ll never escape. To further push this idea of perfection into the spotlight, like a carrot held out of reach of a ravenous rabbit, is the guilt that forces it’s self onto women day and night. A crazed little monkey holding tightly to your neck riding your back until you feel as if you can no longer breathe. When I was in college I never worried, I let everything just happen. I never worried about money or clothing or my weight. I never worried about what my house looked like when we had a party or meal planned for a week in advance. I didn’t think about failing and only thought about succeeding. I never lost sleep over things that were out of my control, I just let life happen. I wore what I wanted to and said what came to my mind. I made friendships that meant something and made no effort to small talk with people I didn’t care for. I let life happen. Now all I do is plan. Filling days with check marks and lists. I don’t let anything just happen. Never saying “self-look what you HAVE done today!” rather than “what more COULD have you done?” Then the creation of the To-Do List for the following day begins. Knowing but not embracing that there is only REAL time in this moment now, the past is no more and the future isn’t even here. Instead of flourishing in It doesn’t matter if a woman is a mother, married, this exact moment we start preparing for what is to come and step over what is exactly here now. Failing to let it all just happen now. What if women (and men) were to just let life happen? Would it be so bad? Reflecting on those days of no worry with life just happening, I recall only happiness and a sense of comfortable content. I think that’s why I love having infants because during that first year of baby everything is so unpredictable that there isn’t a need for check marks and lists, there’s only living (or if you have twins,surviving). All you worry about is holding this little amazing bundle of love that you created and life just happens. That frantic hamster doesn’t exist, that pink wheel is donated to Goodwill and life is good. 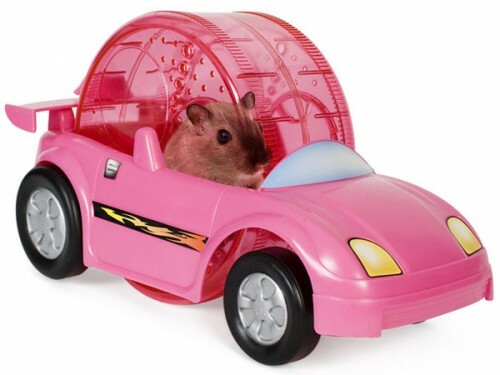 I don’t want to be a frantic hamster anymore, but I also don’t want to have another baby in order to donate my hot pink wheel of anxiety. I do want to start letting life just happen. I want to embrace the only REAL time we have. I want to flourish in this exact moment because we aren’t guaranteed the next. I’m challenging my control freak self to let life just happen. In turn I challenge all of you to do the same. Put away the hot pink wheels in the form of To-Do Lists, Pinterest boards, recipes and pedometers. Stop planning the next moment and live in the present. It’s amazing the amount of stress and anxiety that melts away and doesn’t actually exist when the layers are peeled away. Take inspiration from the leaves of autumn. Let the expectations and rules go, turning from vibrant colors in our lives to dark brittle dust that’s whisked away by the brisk winds of a new season of life, a season of happening, not planning. Using Pinterest Doesn’t Make You a Mom!